By 1938 there was no doubt anymore about the intentions of Germany’s Third Reich and Adolf Hitler. European nations were generally worried about a major war and to that end the two biggest powers in Europe: France and Great Britain, sought to avert it. It was based on the experience of the First World War in which millions had died. The aftermath of that war was a sentiment that total war must be averted at all costs. So far all of Hitler’s violations of treaties, such as occupying the Rhineland in 1936, had caused no major retribution even if it was a major violation of the Treaty of Versailles that Germany had agreed to in 1918. In spring 1938, Hitler claimed that German-speaking people living in Sudeten region of Czechoslovakia wanted closer ties with Germany and began agitating that unless this was done it would be taken by force. Hitler claimed that this region was part of a Greater Germany. Needless to say, the Czechoslovakian government was concerned. Hitler had annexed Austria in 1938 and he might just do the same to Sudeten. Czechoslovakia had a pact with both France and Great Britain to come to its defense. Neither power was interested in having to defend Czechoslovakia on the battlefield. 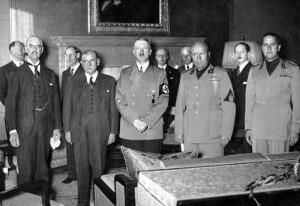 Both Britain and France sought to avoid a war and both agreed, without bothering to consult with the Czechoslovakians, they would give Hitler what he wanted. The deal was that in areas of fifty percent or more German Sudetens would go to Germany. Germany acquired not only territory but the industrial resources that it needed (raw ore, steel and iron production, electrical plants). Czechoslovakia was diminished as a result. While many in public in Britain and France heralded the agreement as avoiding war, there were warnings it was wrong. Winston Churchill was critical of the deal and how they had abandoned Czechoslovakia to Hitler. The British Labor Party opposed the deal as well. A view began to emerge and would continue long after, that Britain and France wanted to get out of the military pact as they were not ready for war. Was Hitler bluffing or not also is discussed as well. The evidence is that Germany could have invaded but got what it wanted without firing a shot. And it was handed to Hitler on a platter by two powers that in the last war had been Germany’s enemies. It could not have been a greater present for Hitler. Czechoslovakia was doomed by the pact. In October 1938, it was forced to hand over under the Vienna Award territory in its south to Hungary and a small concession to Poland. In March 1939, after Slovakia seceded to become a pro-German state, Hitler demanded Czechoslovakia accede to German occupation, which it did. Czechoslovakia then became a protectorate of the Third Reich. Churchill’s warning had come true. With his policy of appeasement now deemed a total failure, Neville Chamberlain realized that it was time to mobilize for war. The French would likewise make preparations (but so entrenched was the avoidance of total war doctrine failed to act when it had the option to do so when most of the German army was invading Poland). In September 1939, World War II would officially begin with the invasion of Poland and declaration of war by Britain and France on Germany. 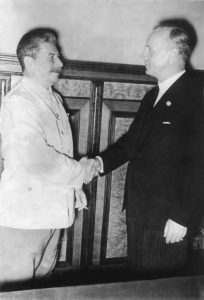 The lesson of the Munich Pact is that making short term deals with dictators to gain a moment of peace comes at a high cost. The Czechs were abandoned by Britain and France to their fate because neither one wanted to stand up to Hitler. Both Chamberlain and his French counterpart would live to see how badly it would turn out. After war broke out, Chamberlan’s popularity fell and would resign on 10 May 1940 and replaced by Winston Churchill though remained in the Cabinet. He would die in November 1940. Édouard Daladier, who was under no illusions as to Hitler’s goals (but knew support for standing up to Hitler was thin),had resigned his position in March 1940 but was still minister of defense when Germany invaded. He would be arrested and charged with treason by the German supported Vichy government and imprisoned. He would be imprisoned in several places, including the Buchenwald concentration camp and ended up in Itter Castle in Tyrol with other French dignitaries until liberated on 5 May 1945 after the Battle of Itter . He would return to the Chamber of Deputies after the war, served as mayor of Avignon, and died in Paris in 1970.